Anyone here good at identifying golfer's signatures? I volunteered at an auction event a few years ago and as a thank you, they gave me this framed poster with signatures. The event sponsors mentioned it was from the 2015 Allianz Championship: https://www.golfchannel.com/tours/ch...-championship/ Can you help identify any of the names on it? Any idea on a value, if any for it? Recognize the photo's. I would guess their signature would be one or near their photo. Freddie Couples, Bernard Langer, Tom Lehman. The photo on the bottom in red name I know but can't recall right now. Just1more and MonarkBoats like this. Gary Koch, Hale Irwin, Berhard Lager, Bart Bryant, Russ Cochran. back at it likes this. Burn Hard Longer is there. To me, it looks like these guys now that I used your link. Not worth much IMO. What ? A piece of golf memorabilia without Woods’ face on it ? That’s bound to be worth something. Consider yourself LUCKY !! jeff7y28 and REMfish7 like this. So what do you want to do...sell it?? Pawn it?? May need to add some more belly to be Mark. Looking closer and guessing more, I'm thinking the guy in the middle is Hale Irwin. His signature is written right across his wrists..
Last edited by round2it; 07-02-2018 at 01:52 PM. I don't think anyone has called out Mark O'Meara yet. He's in there toward the bottom. edit: it looks like someone did it in the mean-time while I was looking...... If you're not first, you're last. 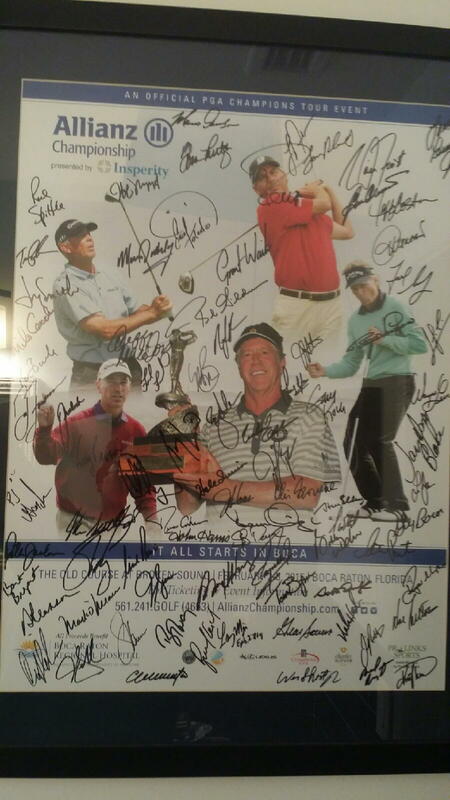 I believe the one tagged as Curtis Strange is actually Freddie Couples. It's a good thing these guys can play cause they sure can't write!!!!! Tom Byrum, Jay Don Blake, Gary Koch, Grant Waite. I can't see anyone paying anything for this. That was my first thought as well. But looking at the golfers playing the tournament Freddie wasn't in the field. Dunno. Estaban Toledo, Bart Bryant, can't remember if he or his brother Brad was Dr. Dirt.